Gus Fring is dead and there’s a new sheriff in town, the one and only Heisenberg. But as Mike told Walt, “just because you shot Jesse James, doesn’t make you Jesse James.” This message doesn’t seem to have reached Walt however, and he’s bought into the Heisenberg myth perhaps more than anyone else. This week’s episode began with Walter getting his Pontiac Aztek, the same dinky used car he’s been driving since the pilot, back from the shop. Very quickly however, he decides to sell the car for a mere $50 before buying a muscle car for himself and then one to match for his son. This decision serves as an “up yours” to a number of people. The first and most important being Skyler. We all remember way back when Walt tried to buy his son’s love with a pretty new Dodge Challenger. Skyler quickly put an end to that. The Challenger was returned for something safer and more sensible and Walt was forced to get his “silent” revenge by doing donuts in a parking lot before blowing the car to pieces (which he made reference to in this episode, well the donuts anyway). Nowadays, Skyler can’t keep Walt out of her bed, or their house, let alone tell him what he can and can’t do with his money. Secondly, Walt was telling Gustavo Fring to shove it up his very dead you know where. It’s clear that Walt is sick of the carefully maintained upstanding citizen routine that characterized Gus’s reign. Walt is in charge now and he wants to make sure everyone knows it, even his neighbors or anyone who happens to walk past his driveway. Last week’s episode was about Walt’s cold war with Mike, the competition for head honcho in their little business venture. This week, Walt’s got a new enemy, one that’s closer and more intimate than he ever expected—Skyler. Her actions last week amounted to being uncomfortably numb, looking dazed and confused, completely unable to handle what’s going on around her. Things changed in “Fifty One” as Skyler began to fight back against her controlling, manipulative husband in what small ways she can manage. Things began much as they did last week. Skyler sat silent at the dinner table, saying nothing about the new cars. Next, we saw her tying floss tightly around her finger, which is either foreshadowing her hanging herself, being strangled, or strangling someone. That or it’s an enormous red herring. Skyler’s last move that was in any way reminiscent of what we’ve seen from her so far this season was quietly asking Walt what he thought about sending Walter Jr. to boarding school to put him in a “new environment.” Big bad Heisenberg quickly shut that notion down. It’s at Walt’s birthday party that Skyler changes up her plan, recognizing that she will not be able to beat Walt at his own game. If she wants to get the kids out of the house, she’s got to play into the “I’m the victim” image that her husband has created. As Walt describes (and perhaps embellishes) a story about his struggle with cancer, Skyler walks into the pool. It’s the one thing she can think of that will both give her a moment of silence, a break from Walt’s endless plays at martyrdom, and make it clear to Hank and Marie that their home is not a safe environment for the children. Wearing a bright blue skirt she slowly walks to the deep end of the family’s bright blue pool—a symbol of Walt’s product and her descent into the chaos that it creates. Skyler finally recognizes that without telling the truth, which she cannot do given her own part in the criminal empire, the fact that it’s Walt who endangers the children will never be revealed. Instead, she will have to take the blame by making her mental struggles and the uncertain state of their marriage (seemingly as a consequence of her actions) the reason the kids need to be somewhere else. After Hank and Marie leave and the decision is made that the kids will stay with them for a while, Walt and Skyler begin the conversation that makes Walt positive that his wife is now his biggest obstacle. Stalking around the bedroom, Walt decimates each and every argument Skyler puts forward. In his mind, he’s the kingpin who beat Gustavo Fring, there’s no chance in hell that he’ll be undone by someone as devoid of “power” as Skyler. She tries to hurt herself, he’ll have her committed. She makes it look like Walt beat her, he’ll tell the police about her involvement in Ted Benake’s tax schemes. “What’s the plan,” Walt screams, before Skyler finally admits surrender. She has no plan, no power, but she “will count every minute that the kids are out of the house as a victory.” All she can do is wait. For what exactly? 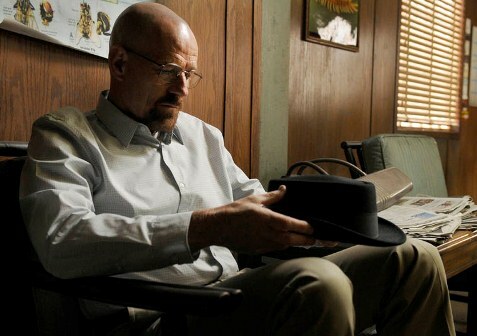 “For the cancer to come back.” Later, Walt returns from a cook to find Skyler chain smoking. Is she succumbing to the one vice that helps calms her nerves, or is she passively-aggressively trying to bring Walt’s cancer back? Even after everything that Walt has done, that was a cold reminder that even if no one else can stop him, his own body just might, and that his home, the one place that he’s tried to make safe no matter what, is now where his greatest enemy resides. Watch the cast and crew go inside “Fifty One” below and follow the writer on Twitter @NateKreichman.